Compact, lightweight multi-function control module puts a variety of operational functions right at your fingertips. Comes with mounting clip for attaching to apparel or any convenient location in the cockpit. Roll over numerals surrounding module at right to view features. For complete operational information, view the DC ONE-X Quick Start Guide. The DC ONE-X control module snaps securely into the durable, high-impact plastic mounting clip for attaching to apparel or anywhere in the cockpit. 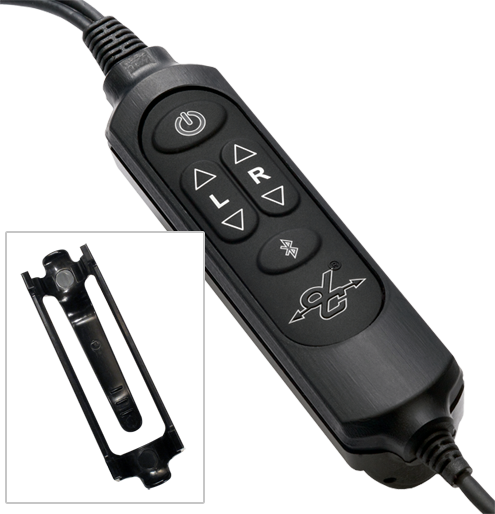 Keeps control module conveniently within reach for easy operation.